AllStar this week reported that Hanson will appear as themselves in the Dolly comedy Frank McKlusky, C.I., currently shooting in Los Angeles. The story said that the title character, an insurance claims adjustor whose parents are portrayed by Dolly and Randy Quaid, chases someone through a Hanson concert. It is also expected that the teen group will contribute a song or two for the soundtrack. (No word on if a Dolly tune will be on there as well yet.) The article further noted a few other supporting cast members will be wrestler Chyna, comedian Tracy Morgan and Scott Baio. Steve Romanoski of I-Bluegrass Magazine recently gave Dolly another rave review for Little Sparrow. While he praises The Grass Is Blue for its purity and sincerity, he noted that many who loved the new Dolly bluegrass were "shocked" that Sparrow was "far less of a bluegrass effort." However, he said the new CD was "true Americana," much of which with a bluegrass tint. "However, more often than not, Dolly is looking to spread her wings and fly to another flower. She proves herself capable of working in a myriad of styles." The styles move from bluegrass to contemporary folk to mainstream country, with even a little country/rock and jazz swing. While he says it probably won't win her a second International Bluegrass Music Association honor for Album of The Year (as Blue won), it shows "the world that she can utilize a bluegrass band to stretch beyond the boundaries that is still tied to the sound. Dolly is an innovator when she chooses to be and, while I was far more excited by her initial foray into bluegrass, Little Sparrow just might bring the music greater success." Read the full review here. Thanks, Greg! I came across a story by Miami Herald writer Howard Cowan (reprinted in yesterday's Wichita Eagle here) which critiqued the recent fall in sales by country superstars and the genre's branching out in highly popular folk and bluegrass efforts, noting Dolly's The Grass Is Blue and Little Sparrow. However, while he notes the CDs have received critical acclaim, which is true, he also said they have outsold the "regular country records" Dolly has released over the past decade. Now, while both CDs have sold well for Dolly, averaging about 130,000 copies each (almost unheard-of numbers for bluegrass), they are still below several of her releases from the past decade. Of course, 1999's Trio II sold very well, reaching about 450,000 units as of the last figures I saw. Also during the past decade, she had one gold album surpassing the half-million mark (1993's Honky Tonk Angels) and two platinum albums past the million mark (1991's Eagle When She Flies and 1993's Slow Dancing With The Moon). And while I don't have actual numbers for the other albums released over the past 10 years, they probably sold close to the numbers seen with Blue and Sparrow. Based on chart positions I can make an educated guess that Heartsongs in 1994 and Something Special in 1995 sold slightly more than 100,000 copies each. Straight Talk, Treasures and Hungry Again were probably each near the 100,000 mark. Little Sparrow moves up one spot on the U.K. country albums chart's May 27 edition to No. 6, marking its 17th week on the chart overseas, where it peaked at No. 1 for eight weeks and No. 30 pop. The June/July issue of folk music magazine Dirty Linen features an article on Dolly. You may read an excerpt from their online version here. Thanks, Greg! Dollymania is pleased to be the first Dolly site to bring you a first-hand review and gallery from last week's tribute to Dolly in New York City organized by the Chelsea Mountain Boys. A big thank you goes out to Greg K. for contributing this piece! Click here for all of it! Little Sparrow continues to fall on the Billboard country albums chart released Thursday. For the June 2 issue, the CD slides seven more places to No. 47 in its 17th week. On the independent albums chart, it drops 13 spots to No. 39. What If I Don't Have A DVD Player? I'm told the new Hank Locklin CD Generations In Song, which features his duet with Dolly on "Send Me The Pillow That You Dream On," is out, but it must be on a small label because I could not find it at any major retailer. You may order it, though, from 1-877-GETMYCD. Thanks, John! Ever wonder what happened to the antique carousel at Dollywood? Well, leaders in Lancaster, Pa., hope to install it on their town square. The Rocky Springs Carousel Association hopes to have the full $1.3 million purchase price raised by a May 31 deadline, according to their local paper. It operated south of town in Rocky Springs Park from the late 19th century until the early 1980s and soon after moved to Dollywood, where it ran until a few years ago. You may read more about the carousel here. Gary Graff published a great article Monday on Entertainment News Daily centering on Dolly's newfound success with folk music and bluegrass from The Grass Is Blue and Little Sparrow and offering a pretty comprehensive overview of her career. You may read the story, called "Back to Basics, And Back on Top," here. Little Sparrow falls two places this week on the U.K. country albums chart to No. 7. The CD, which is in its 16th week on the charts overseas, peaked at No. 1 country for eight weeks at No. 30 pop. Dolly's Splash Country made a splash of its own at opening ceremonies over the weekend, I'm told. Dolly pushed the plunger on a "TNT" box to explode some fireworks and waterworks, introduced her special Olympic swimming champion guest, answered media questions and performed "Islands In The Stream" with her brother Randy. Dollymania friends Chris Barnes and Debbie Poole were kind enough to provide some photos for your viewing pleasure. See Debbie's here and Chris' here. (Image at left courtesy Debbie Poole.) Thanks, Debbie and Chris! Dollymania pal Greg was able to attend The Chelsea Mountain Boys' tribute to Dolly, "A Chest Full of Dolly," last week in New York City and reports that it was "thoroughly enjoyable!" He said a standing-room-only crowd listened to about 30 musicians and singers run through 32 Dolly classics in the salute to "the Fairy Godmother of Country Music," which lasted more than two hours. Dolly's producer, Steve Buckingham, attended, I'm told. Greg says a full review, set list and photos will be on their way for Dollymania readers very soon! Thanks, Greg! It has been confirmed that Image Entertainment plans to release Dolly's 1999 Lifetime television film Blue Valley Songbird in the U.S. on DVD July 3. This will be the fourth Dolly film on DVD (after Unlikely Angel, Steel Magnolias and 9 to 5). Reserve your copy now here. The Dollywood Foundation has awarded Sevier County High School valedictorian Chastidyi Wilson $15,000 as the first recipient of The Dolly Parton Scholarship, an honor which will be bestowed each year to an outstanding graduating senior from Dolly's alma matter. The new water park will be environmentally friendly, park officials say. Among the techniques utilized at the 28-acre facility: a state-of-the-art water filtration system to limit the amount of "new water" required for the attractions; recycled milk bottle plastic in boardwalks, benches and tables; recycled wood formerly used as track supports for Dollywood's Thunder Express Roller Coaster, dismantled in 1998, which are being used to support potted plants; and a massive tree planting project, which plants seven trees for each single tree removed during construction. Speaking of Songcatcher, SonicNet reviewed the soundtrack Thursday, noting that Dolly's cut provides one of the most "thrilling" moments on the CD. The review calls the duet with actress Emmy Rossum "wonderful" and says it "� finds Parton playing savvy, finger-shaking mama to Rossum's ingenue." Read the full review here. The New York Post on Thursday offered a great little story on The Chelsea Mountain Boys' tribute to Dolly last night (Thursday) at Downtime in New York. The article quoted band leader Chal Pivik praising Dolly, saying: "She has always been an overlooked genius of a songwriter, one of my favorites." Dolly herself sent them a note saying the tribute to her songwriting is a wonderful honor and that she likes what the band calls her. "I especially love being called the 'Fairy Godmother of Country Music,'" she said. "Who knows - that might become my official title." Sugar Hill Records sent along a box of CDs, photos and autographed posters to auction off at "A Chest Full of Dolly: A Salute to the Fairy Godmother of Country Music." Proceeds from the auction will benefit her Dollywood Foundation. Read the full story here or here. USA Today on Tuesday reviewed the Songcatcher soundtrack, giving it three out of four stars. The review praised the revisiting of folk songs on the CD but also threw a laurel to Dolly. It said that while her duet with Emmy Rossum on "When Love Is New" is a new composition, it seems "to seep out of the ancient hills themselves." Read the full review here. My copy of the Moulin Rouge soundtrack arrived this week, and while it includes just one performance of the chorus to Dolly's "I Will Always Love You" by Nicole Kidman, Ewan McGregor and Jamie Allen, Dolly gets an additional honor. Out of the 40 or so songwriters whose material is included on the soundtrack, she is among only four who are thanked in the acknowledgment section of the CD. Joining her are Sirs Elton John and Paul McCartney as well as Craig Pierce, who co-wrote a song for the film with its director. Pretty good company! In an interview published Tuesday on BBC Online, Radio 3 personality Andy Kershaw, who hosts the popular Radio 3 Friday night show, was asked which current artist does he most admire: Dolly! Little Sparrow inches down another position to No. 5 in the U.K. country albums chart released Sunday. The CD, which spent eight weeks at No. 1 on the country side overseas and peaked at No. 30 on their pop chart, is in its 15th chart week there. Orange County Register columnist Ben Wener offered a wonderful piece in Friday's issue lamenting on the current state of film soundtracks but explaining that the unexpected million-selling success of the pure roots music of the O, Brother Where Art Thou? disc offers hope, which he says in a perfect world would turn listeners on to Dolly. He writes: "Thus, for some, hearing it is an ear-opening experience that, I pray, leads the narrow-minded to artists they otherwise wouldn't have dared approach for fear their impeccable taste would be compromised. My dream scenario: A Beck-lovin', techno-dabblin' "Morning Becomes Eclectic" fan picks up on O Brother, goes nuts for bluegrass, then gets directed to Dolly Parton's glorious Little Sparrow, which is every bit as steeped in tradition without being musty or highfalutin about it. I don't think the possibility is too unlikely. These days genres are cross-pollinating like bumblebees swarming on a nursery � and lately everyone's pistil has been sticky with excited discovery." He continues to give brief reviews of several other current soundtracks, including Songcatcher, about which he notes Dolly's appearance is natural. Further, he calls the CD "captivating" and adds, "Could cause a stir if word gets out to the Coen Brothers' crowd." (The Coen brothers are the filmmakers behind O, Brother, which, by the way, was filmed largely up the street from my house in Canton, Miss.!) You may read his full story here. And speaking of Songcatcher, according to an article in Friday's Kansas City Star, Sara Evans chose to sing "Mary of The Wild Moor" for the soundtrack because producers played her Dolly's version from Heartsongs when they gave her a selection of five songs from which to choose what she'd perform. She also noted that she grew up a Dolly fan, loving to perform Dolly songs with the bluegrass band she had as a child and teen-ager, for which she was lead singer and mandolin player. Read the full article here. And get your copy of the CD here. I'm told that Dolly was featured in Bay News magazine last week in an article addressing the current sales slump in country music. The article opined that more pop-leaning country performers may not be good for the genre because they are being hyped so intensely that many fans are embarrassed to say they like them. It continued to say that when artists like Dolly and George Jones were the industry leaders, even though their records sold in the millions and, in Dolly's case, brought major pop success, they were still true country songs: hard living men and hard loving women telling their stories of heartache and betrayal, yet still capturing a sense of hope within their despair. Thanks, Michael! After two weeks on Rolling Stone Online's Hot List at No. 9, Dolly fell down over the weekend to No. 192. Her page on their site is located here. Little Sparrow drops two more places in the May 19 Billboard country albums chart, released Thursday, falling to No. 38 in its 15th week. On the independent albums chart, it slides one spot to No. 33. Sherrie Austin's Followin' a Feeling, which features her cover of Dolly's "Jolene," drops two notches to No. 64 in its seventh week on the country albums chart. Regular Dollymania readers know that Austin's version of "Jolene" dropped off the country singles charts in the May 12 edition after peaking at just No. 55 with three weeks on the chart. I haven't received my copy of the CD yet to hear what it sounds like, but according to the Associated Press, the Dolly song included on the soundtrack and in the film Moulin Rouge is none other than her all-time classic "I Will Always Love You," apparently performed by Nicole Kidman. An AP story on the film noted that Kidman and co-star Ewan McGregor perform the medley in which they trade lines from the Beatles' "All You Need Is Love," U2's "Pride (In the Name of Love)," Paul McCartney's "Silly Love Songs" and "I Will Always Love You," among other songs. This marks the third time the song has appeared on film. As I'm sure you recall, Dolly took it to No. 1 on the country charts for a second time when she performed it in 1982's The Best Little Whorehouse in Texas, and Whitney Houston stayed atop the pop charts for 14 weeks with her cover from The Bodyguard in 1992. (Of course, Dolly herself had a hit with this original composition first in 1974 and for a third time in 1995 as a duet with Vince Gill. She's joked that it's like one of those monsters from the old horror films you think has been killed but keeps coming back again and again with new life!) You may order your copy of the Moulin Rouge CD here. And speaking both of Moulin Rouge and Whorehouse, an article in next week's issue of Time showcases the new film, complete with a sidebar lamenting the lack of successful musicals in today's moviehouses. However, the author must have forgotten about Dolly's second film when he wrote the story. It stated that 1978's Grease was the last successful live-action film musical and that since then only animated musicals have had success both at the box office and on radio. Well, Whorehouse came out four years after Grease and grossed nearly $90 million in the U.S., making it the third-most-successful musical film of all time, and its soundtrack produced the country No. 1 "I Will Always Love You" as well as country No. 8 "Hard Candy Christmas." Dolly has long prided herself on habitually making fashion gurus' "worst dressed" lists each year, but a poll in USA Today online didn't put her very high up at all in this category. The poll asked who is the worst dressed celebrity of all time, giving as options such style assasins as Cher, Courtney Love, Marilyn Manson, Cyndi Lauper, Boy George, Tommy Lee, Christina Aguilera and Dolly. Well, as of the last update, Manson was by far the winner with about 40 percent of the vote, and those casting their ballots felt Dolly was the best-dressed of the crowd, placing her last with only 3 percent. The poll was located here. And while she couldn't be there in person (apparently due to filming her new movie), Dolly made an appearance via video at Wednesday night's Academy of Country Music Awards (hosted by LeeAnn Rimes since Dolly couldn't return as hostess this year). During a segment honoring pal Barbara Mandrell for the Pioneer Award, Dolly said that God places most stars in the sky but that she was thankful He had placed one, Barbara, on Earth to inspire us all. And speaking of her new movie, according to eidc.com's Film Shoot, Dolly's upcoming Disney film Frank McKlusky, C.I. will be very busy in coming weeks, with 16-hour shooting days scheduled for Monday at Le Sage Avenue, Wednesday at Soledad Canyon Road, May 17 at West Washington Boulevard, May 19 at South Wall Street and May 22 on East Sixth Street. Apparently, the locations are in Los Angeles, but there is no word on whether Dolly is involved in these shoots. Thanks, Kenny! I'm told the June/July issue of Country Music magazine features a photo study of Dolly's different "hair" styles over the years, as we all know she's gone through more wigs during her career than could fill any mansion. Thanks, Justin! Dolly announced at MerleFest that she would be filming a video last week for the next single from Little Sparrow, "Shine," and on Monday, bluegrass band Nickel Creek chronicled their inclusion on the project. Two members of the band participated in the video, shot on Tuesday of last week. Their site is located here. Thanks, Justin and Greg! I haven't heard the CD yet, so I don't know which song is on there, but there is a Dolly song covered in the new film Moulin Rouge. The song is included in a medley titled "Elephant Love Medley" (guess we'll have to wait for the film to see what that means), which is featured on the soundtrack and is comprised of songs by Dolly, KISS and Elton John. The CD is to be released today. Get your copy here. Even as the CD continues to dip in the U.S. charts, Little Sparrow remains strong across the pond, holding steady at No. 4 in the U.K. charts released Sunday. In its 14th week on the charts there, the CD peaked at No. 1 on the country side for eight weeks and No. 30 on their pop chart, compared to a peak of No. 12 country and No. 97 pop stateside. Dolly's often overlooked songwriting mastery will be honored May 17 at a special concert by more than 20 local artists in New York City at the Downtime (251 West 30 Street at Eighth Avenue). The salute, organized by the band Chelsea Mountain Boys, refers to Dolly as the "fairy godmother of country music" and promises to offer a revue of her songs from the early days at Monument Records in the mid-1960s through her current bluegrass numbers. Admission will be $12 for the 8 p.m. show, called "A Chest Full of Dolly." For more information, visit the Chelsea Mountain Boys' Website here. 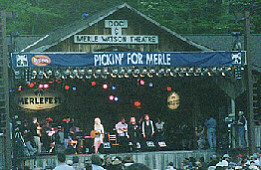 Dollymania reader Greg K. was kind enough to forward me a photo he took of Dolly performing at MerleFest. Shown at left are Chris Thile, Steve Buckingham, Jim Mills, Barry Bales, Dolly, Bryan Sutton, Claire Lynch, Jerry Douglas, Keith Little and Sam Bush. Thanks, Greg! I'm told that "Mountain Angel" has been getting a little radio play in the Appalachian region of north and central Alabama, while the southern area of the state has been hearing "The Salt in My Tears" for some strange reason, as the song was never played there when it was originally released as a single in 1998. Thanks, Michael! Little Sparrow slides a little further in the May 12 Billboard album charts released Thursday. On the country side, the CD, in its 14th week on the charts, falls three places to No. 36. On the independent label albums chart, where it is also in its 14th week, it drops seven slots to No. 32. Sherrie Austin's cover of the Dolly classic "Jolene," however, meets a worse fate, dropping off of the country singles chart after staying only three weeks in the top 75 and peaking at No. 55, as her CD , Followin' a Feeling, drops three places to No. 62 on the country albums chart. Country.com on Thursday finally posted a story mentioning Dolly's appearance at last weekend's MerleFest. It noted that her set was "the biggest show of all" at the festival and that she "held nothing back in proving her devotion to bluegrass music." It added: "Her voice melted beautifully into heartfelt bluegrass ballads and even restarting a song after swallowing a bug didn't dampen the energy of her performance. A near-record crowd was on hand to witness her first appearance at MerleFest, and they couldn't have been more enthusiastic at watching this well-known country star kick up her heels and throw down with the best of them." For the full story, click here. Thanks, Sheena! Jennifer at Sugar Hill Records alerted me to a contest currently running at music.com to promote Sparrow in which you may enter to win a guitar autographed by Dolly. The prizes, supplied by the record company, are the autographed guitar and an autographed copy of the CD for one grand prize winner, an autographed CD and tickets to Dollywood for two first prize winners, and autographed CDs for two second prize winners. Entries, limited to one per person, will be accepted through May 28 with winners chosen June 4. To enter, click here. Thanks, Jennifer! The industry magazine Shoot Sheet in Los Angeles says Dolly's upcoming Disney film Frank McKlusky, C.I. was shooting this week at 10047 McBroom Street. Thanks, Kenny! Dolly is nominated for the top award, Golden Voice Entertainer, at the Third Annual Golden Voice Awards honoring the legends of country music, it was announced this week. She faces fellow nominees Bill Anderson, Roy Clark, Charlie Pride and Mel Tillis. The winners will be announced at a ceremony June 14 aboard the General Jackson showboat in Nashville. Dolly has yet to win one of the awards, although she was nominated in the same category last year (called at the time "Best All-Time Entertainer") as well as Best Vocal Group (with Porter Wagoner). Well, all sources say Dolly did a bang-up job at her first appearance at MerleFest, the annual bluegrass festival held in Wilkesboro, N.C., over the weekend. The event's headliner, Dolly was scheduled to sing for 45 minutes on Saturday, but she stayed on stage for more than an hour. Ticket sales show the crowd for the four-day festival should exceed last year's total of 65,000. Debbie Poole, official Dollymania correspondent for the event, reports that the show was amazing. She also attended a press conference Dolly gave in which she announced she would be recording a video for "Shine" and making a television film of "Mountain Angel." Debbie also caught some great photos (such as the one on the left). Dollymania reader Greg K. was also kind enough to provide a review of the show, saying Dolly was "flawless!" The articles are as follows: Dolly's Q&A with the media (including photos) here, Debbie's review (including photos) here and Greg's review here. To read a review from Sunday's Charlotte Observer, click here. Finally, an Associated Press photo from Dolly's show is available here. Thanks, Debbie and Greg! Little Sparrow remains in the top 40 of the country albums chart in the May 5 issue of Billboard, dropping three spots to No. 33 in its 13th week. It also falls seven places to No. 25 on the independent albums chart. 1999's The Grass Is Blue, however, falls back off the country albums chart after its 35th week; it had been at No. 74. Another Dolly "appearance" on the charts is Sherrie Austin's cover of her classic "Jolene," which slides down five spots to No. 59 on the country singles chart, while the CD which contains the song, Followin' a Feeling falls a dozen places to No. 59 on the country albums chart. Overseas, Dolly remains steady at No. 4 on the U.K. country albums charts, where the CD spent eight of its 13 chart weeks at No. 1. While back at home, on the bluegrass albums chart published by Bluegrass Unlimited, Sparrow shoots up four places for May to No. 5. Dolly also appears (singing "Cry, Cry Darlin'") on Big Mon, the Bill Monroe tribute CD which remains steady at No. 2 on the bluegrass chart. Dolly made it onto Rolling Stone Online's Hot Artists list over the weekend, coming in at No. 9. I'm not sure, but I believe the list ranks the artists whose pages at the site receive the most hits. Dolly's page at Rolling Stone is located here. Timothy Finn offered a brief review of Little Sparrow in The Kansas City Star on Thursday. He noted, in part: "Her fidelity in the music reveals itself in many places, but mostly in her voice, which has matured as elegantly as the rest of her." Read the full review here. The Hollywood Reporter reported on Thursday that Cameron Richardson will make her feature acting debut as an FBI agent in the female lead of the Disney comedy Frank McKusky, C.I., which will also star Dolly as the male lead character's mother. The film, directed by Arlene Sanford and produced by Robert Simonds, was scheduled to start filming in Los Angeles last week. Dolly is reportedly expected to begin filming her scenes this week or next.